At last, a wine label that’s fairly easy to photograph. And, an easy to drink wine to go with it. This DOC (Denominazione Di Origine Controllata) thing must have something going for it. Here’s another very good wine classified as DOC. As you may remember, the Italian classification system requires wines to come from defined regions of the country and follow certain regulations. It is intended to help assure the consumer that the wine in the bottle matches the claims of the label. The Abruzzo region of Italy is where the grapes for this wine were grown. Abruzzo is located in central Italy. 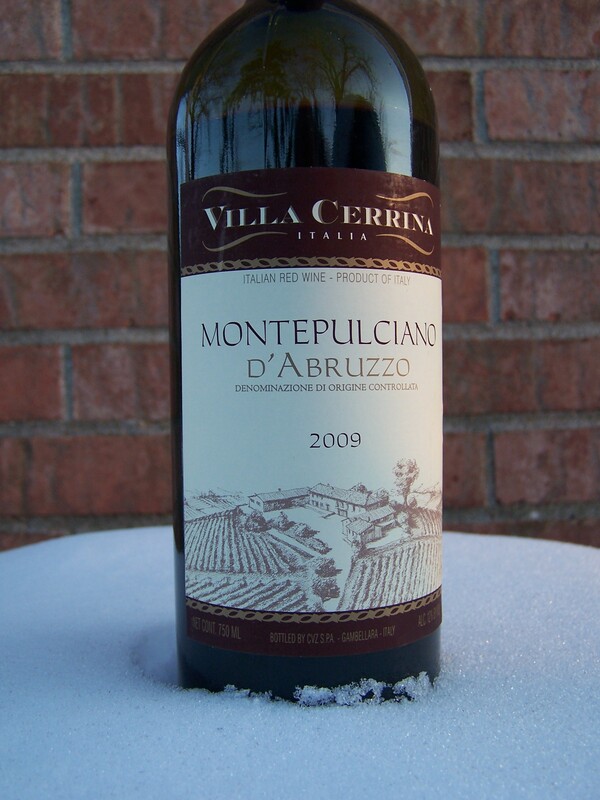 The predominate grape in this wine is the Montepulciano grape. Villa Cerrina, we assume, is the winery that produced the wine. Wow, I hope I got all that right. Regardless of the geography lesson above, this is a very nice wine. It has a distinctly different and stronger taste than either the Chianti or Super Tuscans reviewed previously. The wine also feels drier as it passes through the mouth to the throat. While the taste is stronger, it is still a mellow wine. That is, there are no slightly off tastes or aftertastes. As a stronger tasting wine, it will hold its own better against some of the stronger tasting dishes at dinner. At $4.99 (Trader Joe’s price), this is another very good wine at a very bargain price. If you don’t already believe, start to believe in DOC and Italian wines. This entry was posted on 02/06/2011 at 09:35 and is filed under Trader Joe's, Wine. You can follow any responses to this entry through the RSS 2.0 feed. You can leave a response, or trackback from your own site. For sure, it’s a good wine for this price. Nice review, congrats!